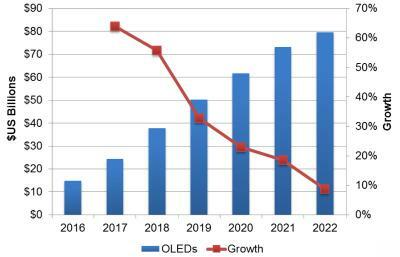 Display analyst firm DSCC released a new market report on the OLED market, in which they have some very interesting estimates on the OLED market. OLED revenues reached over $5 billion for the first time in Q3 2017, and DSCC sees a huge 88% jump in the final quarter of 2017 (to $10 billion) as Samsung starts to supply flexible OLEDs to Apple. Flexible OLED revenues are the main driver of the growth in OLED smartphone shipments, with revenues rising 37% in Q3 2017 and are expected to grow 140% (Q/Q) in Q4 2017. 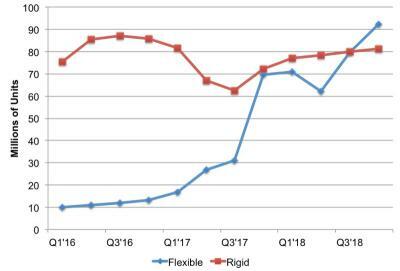 Flexible OLED unit share out of the entire OLED smartphone market reached 33% in Q3 and will reach 49% in Q4. In terms of revenues, the market share will grow from 66% in Q3 to 80% in Q4. Samsung is obviously the leader in OLED production - and DSCC sees its market share at 91% in Q3 2017 - and SDC's share will actually grow to 93% in Q4 2017 (but will fall to 87% in 2018). Samsung electronics was the leading customer for OLED displays for many years, but Apple will overtake Samsung in Q4 2017 and will have a market share of 57% of all OLED orders (Samsung electronics's share will be 26%). Remember Apple is now using OLEDs in three of its products (the iPhone X, the Touch Bar on the MacBook Pro and the Apple Watch). 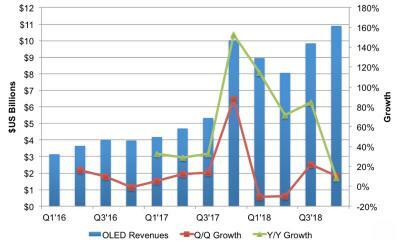 Looking further ahead, DSCC sees OLED revenues dropping 11% in Q1 2018 and a further 10% in Q2 2018 - mostly due to seasonal weakness and a low demand in China due to high prices. Growth will return in the second half of 2018, and altogether 2018 OLED revenues will be 56% higher than in 2017 and will reach $37.7 billion. While growth in 2019-2022 will be lower than before, it will continue to be significant. 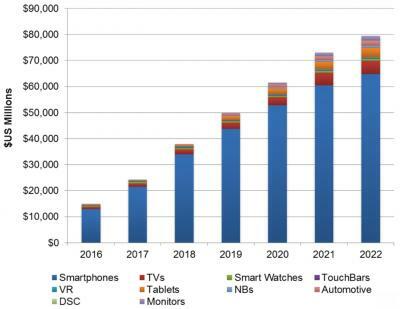 From 2016 to 2022, the market will grow at a CAGR of 32% to reach almost $80 billion.